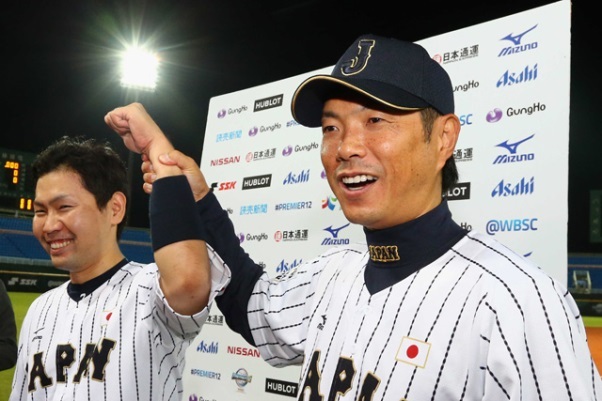 TAOYUAN, Taiwan (Kyodo) -- Akira Nakamura's single in the ninth saw Japan came from behind twice in the late innings to beat Venezuela 6-5 on Sunday and complete the Premier 12 group stage undefeated. After four scoreless innings from the bullpen, Japan took its first lead on a Sho Nakata's two-run, eighth-inning double. The two RBIs lifted Nakata's total to 13 in five group-stage games. Lefty closer Yuki Matsui, however, surrendered back-to-back one-out singles and a walk before pinch hitter Ricardo Yepez pulled a 2-0 changeup down the third-base line for a two-run double. But Japan would not be denied. Kenta Imamiya opened the bottom of the ninth by singling off Fernando Nieve, who hit Shogo Akiyama with a pitch. A sacrifice and an intentional walk loaded the bases with one out, and the tying run scored on a wild pitch. After another intentional walk, Nakamura singled through a five-man infield to clinch it. "If I got a hit, we'd win, so I was desperately trying to put it in play," said Nakamura, who entered as a pinch runner in the eighth. "I never thought it would come down to me. I was nervous but I'm relieved to have gotten a hit." "The atmosphere around the team is really good. We're winning these close games and we're in a really great shape. From here on we are out if we lose so I hope we can all pull together." In other Group B games, Mexico defeated the winless Dominican Republic 9-6 to finish the group stage at 2-3 and earn a spot in the quarterfinals. While the United States defeated South Korea 3-2 in a tiebreaker as both teams finished with 3-2 records. In Group A, Canada beat the Netherlands 3-1 to go undefeated, while Cuba beat Italy 2-1 and Puerto Rico won a thriller to beat Taiwan 7-4 in a tiebreaker. Japan will play Puerto Rico in Monday's quarterfinals, while Canada will play Mexico, the United States will face the Netherlands and Cuba will take on South Korea. "We did well to turn the game around in the end, starting from Imamiya," Samurai Japan skipper Hiroki Kokubo said. "We knew we had won the group before the game so it might have been difficult for the players but we are going to the quarterfinals in a good shape." "Tomorrow we'll go with Kenta Maeda. He is Japan's ace and I want him to be imperious on the mound." Japan starter Yuki Nishi was rocked for three runs in four innings, giving up two walks and five hits, including a pair of home runs: a first-inning leadoff shot to Rainer Olmedo and a two-run, fourth-inning blast by Juan Apodaca. But three scoreless innings of relief from lefty Yudai Ono and another from submarine right-hander Kazuhisa Makita set the stage for Japan's comeback. Venezuela sent Freddie Garcia to the mound and the 39-year-old allowed two runs and struck out four over 7-1/3 impressive innings. A 156-game winner in the majors, Garcia allowed two runs on seven hits and two walks over the first four innings, but just one single over his final 3-1/3 innings. Japan tied it 1-1 in the bottom of the second against Garcia. Yoshitomo Tsutsugo's leadoff walk, a Nakata single and a wild pitch put runners on the corners for Ryosuke Hirata, who singled in the tying run. Back-to-back singles by Nobuhiro Matsuda and Hirata opened the bottom of the fourth to set up Japan's second run. With two outs and Matsuda on third after a double play, Akiyama lined his second single to make it a one-run game. Akiyama was cut down stealing on a pitch out to end the inning, and Garcia retired the next 10 hitters before Tetsuto Yamada singled with one out in the eighth. Garcia came out after 124 pitches in favor of side-arm lefty Jesus Martinez. Shingo Kawabata fouled off four, two-strike pitches before doubling off Martinez to center. After an intentional walk to Tsutsugo, right-hander Yoel Hernandez came in to face the right-handed-hitting Nakata, who once more threw Japan a lifeline.